And, like most things that go into my fridge, it was forgotten...until today that is! Aki found it and before I could tell him not to open it, before I got a photo, there was a quick hissing and the sound of the soda hitting the ice as it was being poured :( So, that's why you have a photo of a half empty/half full (depending how you want to look at it :P) soda bottle. 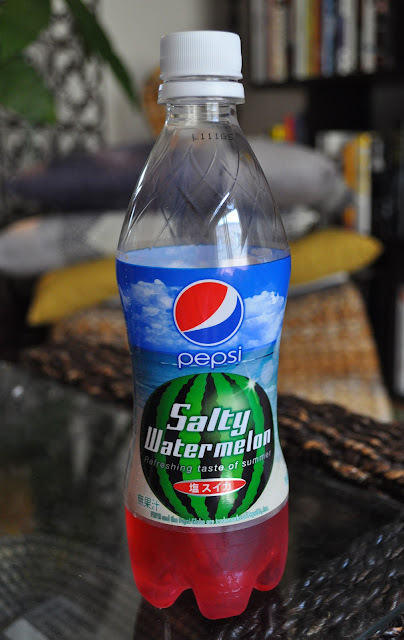 I wasn't expecting Salty Watermelon to taste good (actually, it sounds revolting as I type about it), but this drink was offensive to all my senses (that rhymed). Salty Watermelon tasted like artificial watermelon flavoring, plastic, and dirt...yes, dirt! Do you have a seasonal drinks where you are? Quite an intriguing concept! By the way, I emailed you, did you receive it? I'm impressed you were brave enough to buy it (and that Aki willingly drank it). You brave soul! My husband and I saw that in Lawson recently, and we were like- no.just.no. I did like the white Pepsi they came out with two years ago though! Hahaha, you guys should try it :P Oh, I loved the white pepsi!! Did you try the pink one?? it was god awful! Oh wow!! Salty Watermelon...an adventure for the taste buds! I saw this in Lawson and gagged! Why pepsi why!! Stick to the good stuff!